There was a three-way preflop all-in, with Joseph Cheong all-in for the main pot and Harrison Gimbel all-in against Jon Turner in a side pot. The board ran out 3 2 2 5 5 and Cheong’s kings held to earn him the triple up to 51,000. Turner’s pocket sevens were enough to take down the side pot, sending Gimbel to the rail. Turner ended up with 74,000 after the hand. Harrison Gimbel was short stacked and shoved his last 85,000 or so from the button, but was met with a three-bet shove from the small blind from Sulabh Choudhury. Gimbel’s K 9 was drawing live against Choudhury’s A 10 , but failed to connect as the board ran out Q J 8 2 Q . He earned $7,841 as the 25th-place finisher. On a flop of 9 8 2 , Harrison Gimbel check-raised an early position 2,100 bet to 5,100 and his opponent called. The turn was the 5 and Gimbel pushed out 5,200 and was called again. The river was the 3 and Gimbel moved all in for his last 11,200. 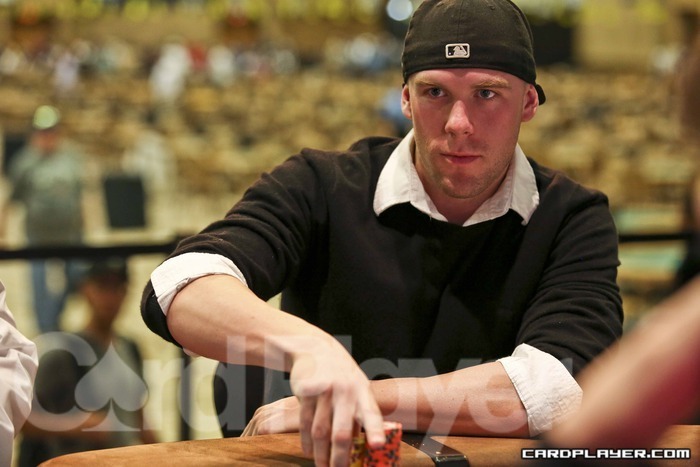 Gimbel tabled 7 6 and scooped the pot as he opponent showed his J J .
Gimble climbs to 46,300 in chips with the pot. As players are still strolling into the tournament area, a few top pros have been spotted at the registration cage and have taken their seats in the field. 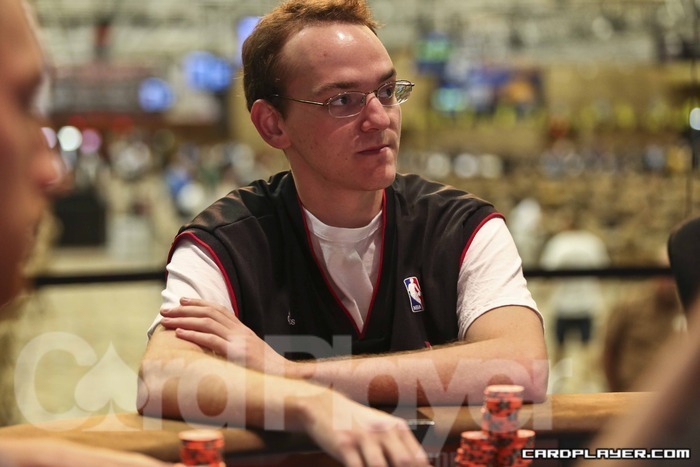 Eric Blair and 2009 PokerStars Caribbean Adventure Main Event winner Harrison Gimbel are seated at the same table. WSOP bracelet winner Chance Kornuth, 2008 November Niner Chino Rheem, former Full Tilt Red Pro Stuart Paterson, and Nancy Todd have all put up the $1,100 to play in the final stop of the 2013 Card Player Poker Tour. After a flurry of preflop raises, Harrison Gimbel and Bobby Bresner got 2,000 into the middle preflop. They checked it to the river as the board ran out J 9 4 4 3 and then Bresner fired out a bet of 2,600. “Ace high,” said Bresner as he showed his A Q .
Gimbel didn’t say anything and showed A 3 , giving him a pair of threes and the pot. “I’m running bad today,” said Bresner who has lost around half of his stack so far today and is sitting with roughly 12,000 in chips. A few players in the field today are taking their second shot at a CPPT title after busting out before the end of the day on Day 1A. Local grinder Georgia Felger, current Player of the Series points leader Jerry Willis, and Maurice Hawkins have all taken their seats on Day 1B and are firing their second $1,100 bullet at the event. 2010 PokerStars Caribbean Adventure Main Event winner Harrison Gimbel is and fellow poker professional Eric Blair are even seated together for the second straight day. Harrison Gimbel became one of the early casualties on day 1A of the CPPT bestbet Jacksonville main event when he five-bet shoved over Greg Cassani with A K only to run into Cassani’s pocket aces. 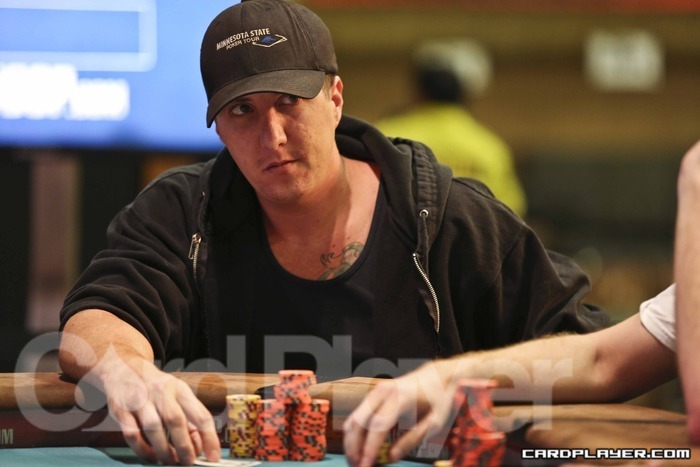 Cassani, a Jacksonville resident, is now one of the early chip leaders. 2010 PokerStars Caribbean Adventure main event champion Harrison Gimbel is in the mix here on day 1A of the 2013 Card Player Poker Tour bestbet Jacksonville main event. 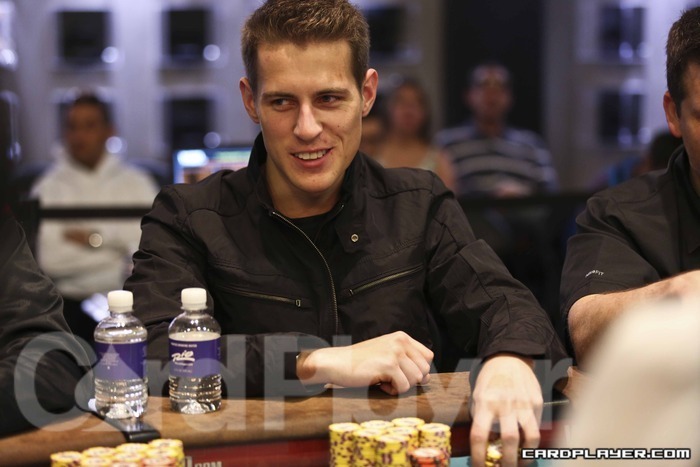 Gimbel, who is a Florida local hailing from the city of Jupiter, will be looking to add to his career live tournament earnings of more than $2.9 million with a deep run in this $300,000 guaranteed main event. Dan Makowsky was just eliminated when his pocket jacks ran into the pocket aces of Harrison Gimbel after a five-bet shove preflop. Three players contributed 800 preflop and the first three cards hit the table 7 3 3 . Harrison Gimbel bet 1,025 on the button after both of his opponents checked. The big blind called but the cutoff folded. The turn then fell 5 and both players checked. The river delivered the 4 and the big blind bet 2,375. Gimbel tanked for a few moments and eventually folded his hand. Gimbel is down to 18,500 after the hand, a little bit less than what he started the day with. Mike Sowers limped into the pot for 5,000, Harrison Gimbel raised to 80,000 and Sowers called. The flop came J 6 3 , and both players checked. The turn was the A , Sowers checked, Gimbel bet 135,000, Sowers shoved and Gimbel called all in. Sowers was ahead on the turn with A 6 for a better two pair than Gimbel’s A 3 . The river was the 9 and Harrison Gimbel was eliminated in 4th place ($72,155). Sowers moved up to about 1.5 million after the hand. On a flop of K 6 2 , John Hayes bet, Sowers raised to 100,000, Hayes moved all in for around 400,000 and Sowers called. Sowers was ahead on the flop with K 8 for top pair against Hayes’ 7 7 . The turn and river were the 4 and the 9 , offering no help to John Hayes who was eliminated in 3rd place ($99,409). Mike Sowers and Greg Hobson entered heads-up play nearly even chips with about 2.1 million each. Seth Davies was previously crippled in a hand after Harrison Gimbel doubled through him by catching an ace on the river to crack Davies’ pocket pair of queens. Gimbel doubled up to about 1.2 million that hand, leaving Davies on the short stack with a little over 4 antes. On Davies’ final hand, Harrison Gimbel opened the pot for 40,000 before the flop, Seth Davies moved all in for 43,000 and Gimbel called. Davies was ahead before the flop with A 8 against Gimbel’s K 9 . The board came K 10 3 3 5 , giving Gimbel top pair on the flop to win the pot and eliminate Seth Davies in 7th place ($30,373). Micke McDonald limped in the pot for 1,000, John Hayes called, Harrison Gimbel raised to 40,000, McDonald called, Hayes three-bet shoved, Gimbel folded and McDonald called all in. Hayes was ahead before the flop with 10 10 against McDonald’s A 9 . The board came 10 5 3 5 5 , giving Hayes top set on the flop and a full house on the turn to win the pot and eliminate Mike McDonald in 6th place ($39,931). Hayes moved up to about 1.1 million that hand. The final table of Event no. 49 ($1,500 No-Limit Hold’em Ante Only) is now underway, and Card Player will be posting level-by-level updates with all of the action, current chip counts, and prize distributions. Day 2 concluded with the elimination of Grayson Ramage in 10th Place ($14,477), and the official nine-handed final table is now set. Play will begin in Level 19 with a 6,000 ante, and will continue until a winner is determined.